It was a common thing, in the age when railways were being built in the British Isles, for a small line, built to serve a local need with locally-raised money, to progress for a while independently but then find it necessary to submit to the offers of a larger line and become absorbed into it, its shareholders exchanging their shares for shares in the larger concern. Business in the Victorian age matched the Darwinian concept of the survival of the fittest; financial and industrial nature, like that of the animal world, was red in tooth and claw and expected to be so. 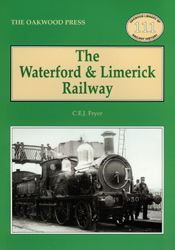 Where the Waterford & Limerick Railway (W&LR) differed from others was in the long drawn out period of its survival as an independent line, and its phenomenal growth, first working and then absorbing other lines – though its financial situation might have suggested corporate suicide on favourable terms long before this actually occurred. However, there were forces operating which helped it survive, and while this was so it kept the illusion of a rise to greatness, before the end of the 19th century it had become the fourth largest railway in Ireland. Then favouring influence ceased, and by 1899 it was clear that it could not carry on alone. After some protracted negotiations the largest railway in Ireland absorbed the fourth largest, and found the digestion difficult. Unlike many other Irish railways constructed during the 19th century, the main line linking the two cities after which it was named still exists, though all but two of its branches and extensions have ceased to carry passenger traffic and some have closed altogether. It is now more used for freight than for passenger trains. However, one can still make the journey from Waterford to Limerick and back in a day all through the year – and twice a day during summer – and find plenty of lineside interest. The line’s period of glory was its final decade as an independent company. It had the good fortune to have then as its locomotive, carriage and wagon superintendent one of the most famous of British locomotive engineers in the days of steam, J.G. Robinson, who learned and developed at Limerick the skills and expertise that were to make him famous on the Great Central. He gave his engines and carriages the most colourful livery than to be seen in Ireland, and the outlines of the few locomotives he designed at Limerick foreshadow the graceful aspects of those he built for the Great Central Railway. The Waterford & Limerick line is still well worth a visit, both for its own sake and for the attractive surroundings, the lush countryside and the charming Irish towns where one can stroll around. A5 format, 160 pages, more than 170 photographs, plans, etc.